Dinner courses are mainly seasonal seafood. Enjoy the fresh taste of ingredients from the northern seas. Sea urchin, soi (rockfish) and other seafood are arranged on a plate made of ice. The most highly recommended is ruibe (frozen salmon), a Hokkaido specialty. 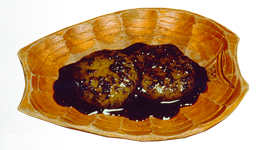 Ruibe means “frozen food” in the Ainu language. Enjoy our special ruibe made by filleting a whole salmon. Kichiji (rockfish), called “kinki” or “memme” in Hokkaido, is caught both in the Pacific Ocean and the Sea of Okhotsk. The succulent fleshy white fish is best enjoyed when simply broiled with salt, a cooking method that best enhances its flavor. Sea urchin, fresh from areas carefully selected depending on season, is cooked with vegetables. A lightly beaten egg is poured over it just before serving. 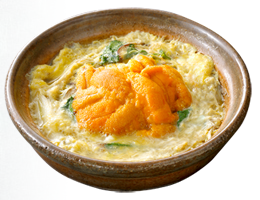 We are proud of the melt-in-the-mouth combination of delicious sea urchin and the soft egg. 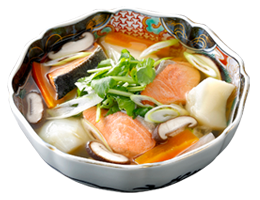 A Hokkaido specialty soup made with an abundance of locally produced salmon, potatoes, Japanese radishes, carrots and other vegetables. 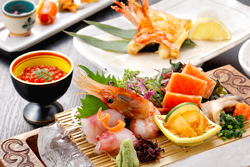 These ingredients are boiled and seasoned with salt and sake lees to enhance the flavor. Sanpei soup is traditionally served in an Aritaware dish called a “Sanpei plate,” after which this dish is named. Horsehair crab caught in Kojohama in Shiraoi, a port town on the Pacific coast is very valuable due to restricted catches. 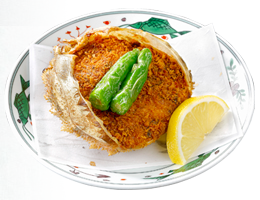 The crab meat is stuffed in its shell and crisply fried. Enjoy the rich flavor that differs from boiled crab. 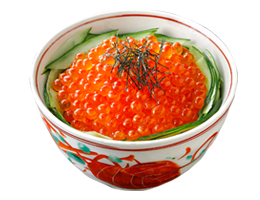 A bowl of rice topped with an abundant amount of large ikura (salmon roe). The salmon roe, marinated in the restaurant’s special soy source, has soft skins due to the fact it is frozen while still fresh and thawed just before serving. Enjoy the fresh, bubble-like feel. Dumplings made from mashed potato are dressed with sesame sauce to produce a familiar taste that’s sure to suit everyone’s palate. 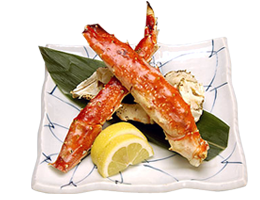 Crab legs that contain plenty of meat are simply broiled to enhance the sweet flavor of the king crab. 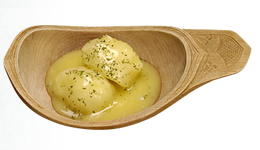 Hot, flakey potatoes boiled with butter and sugar and served in their own sweet, thick juices. 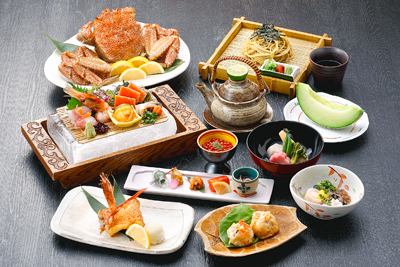 Enjoy the taste of home cooking in Hokkaido.